rokBrothers Blog: Drogba Impressed By Debut, As He Equalises! Drogba Impressed By Debut, As He Equalises! 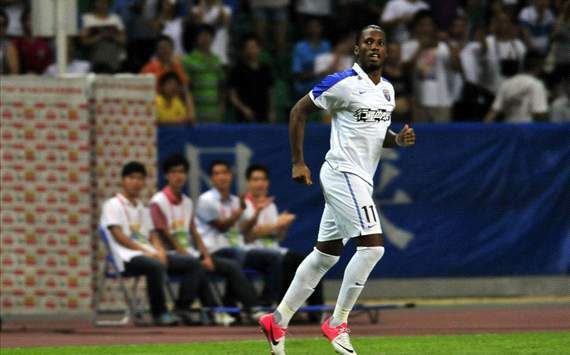 Didier Drogba says he is delighted "everything went right" on his debut appearance for Shanghai Shenhua as he came off the bench to help them earn a 1-1 draw away to Guangzhou R&F in China's Super League on Sunday. With his side trailing at the break, Drogba came off the bench to great effect, changing the atmosphere of the game before providing a delightful assist for Cao Yunding's 68th-minute equaliser. "I am happy that everything went right in my first 45 minutes here," Drogba told reporters after the game. "It was a little bit hard for me to get into the game at the beginning, but when I got used to the rhythm, I began to enjoy the game. "I am feeling good now and was accustomed to all things in China now. It is very comfortable playing alongside my former team-mate Nicolas (Anelka)." Meanwhile, opposition striker Yakubu Aiyegbeni claimed that Drogba could inspire Shenhua, who are currently struggling down in 12th, to the title given his impact on debut. "He showed the quality today you know, he gave more confidence to the team, you have to see the way he played today, when he is 100 per cent, he can help Shanghai win the league," Yakubu said.